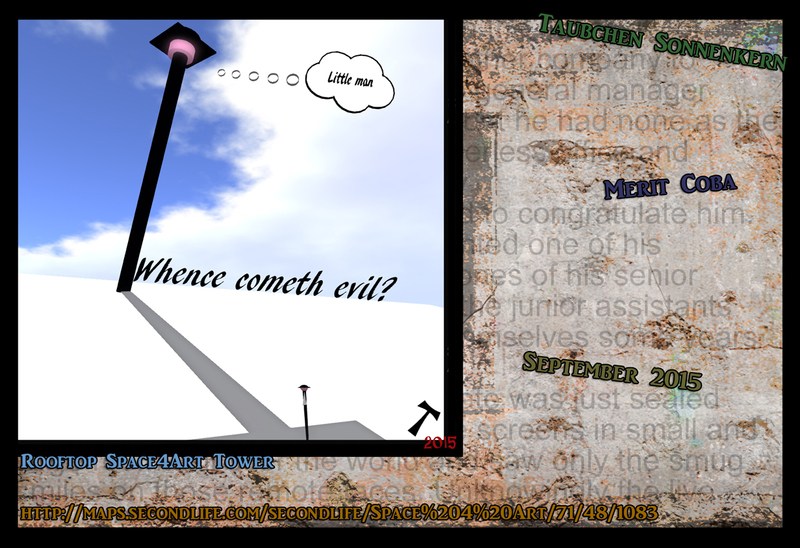 I like to roam through the ever changing galleries of Second Life and sometimes I hit on a work or an artist I like to promote on this blog. As little as it does for them. There are actually more than I display here, many more even, but because I sometimes have to balance other people’s works against our own works. So I don’t display them here. There are enough blogs promoting SL art. But even because of the sheer numbers alone I lag behind. Some of the artists I like actually show adult-related depictions.I am usually not really in favor of adult depictions, not because I feel ashamed, but more because I suspect that the adult content is to make up for the lack of art. It is more about arousal than about art. I never quite understand adult related content in that way. I was once at a gallery dedicated to adult pictures and I met someone who bluntly asked me if they didn’t arouse me as it did her. And I replied kind by answering no. I can appreciate intimate pictures even to the point of feeling a longing, but for me art isn’t something that arouses me. However, to be honest, it sometimes can.Ain’t I the dubious one. Anyway.. this rambling is done to introduce an artist named Sheldon in SL, who is not about arousal but uses what we call nudes not because they are nudes but are the poetry of the human body(sic). I was myself more interested in the materials he used than the imagery itself. And when I asked him about it, we had a conversation about nudes. That is art that shows nudes but is not about them. For me: I like the combination of materials and the use of light. And since I am a movie person light fascinates me, therefore I have him here on my blog. For it is after all about the image. Or the story that lies within. I also like, without trying to insult, to present the work of Angelika Corral, as it is sandwiched into the works of Sheldon. I do this because while Sheldon uses real life models, she works with SL models. And there we have another fascination of mine: SL avatars. I am fascinated by them in a way. Above is a side to side depiction of the works of Angelika en Sheldon. One is showing SL avatars(Synthesis by Angelika Corral) and the other an image inspired by real life(you see from this where I come from) called Curvature by Sheldon. Left to right: Female Back, Distant Memories, Pay what you want, all by Sheldon. I somehow like the right one. After delivering his key-speech on the necessity of outsourcing his employees to another company to prevent layoffs and cutbacks, the general manager made as if to fold some papers, but he had none as the company had become a real paperless office and communicated only electronically. The select few in his room moved to congratulate him. They were familiar faces: the painted one of his personal secretary, the stubbed ones of his senior managers and the fresh ones of the junior assistants who would become managers themselves some years into the future. The mass of employees whose fate was just sealed watched them on small and large screens in small and large rooms all over the world and saw only the smug smiles on those remote faces. Unknowingly the live broadcast had not yet been disconnected, but it didn’t really matter anyway as they had never been connected in the first place.